(Bloomberg) -- S&P futures are running on fumes. There’s not much to go on as major themes -- both political and economic -- ran through the weekend broadly unchanged. But today’s action at first glance will pay a fair amount of attention on the industrials segment following some key analyst attention on some of the Street’s favorite names. 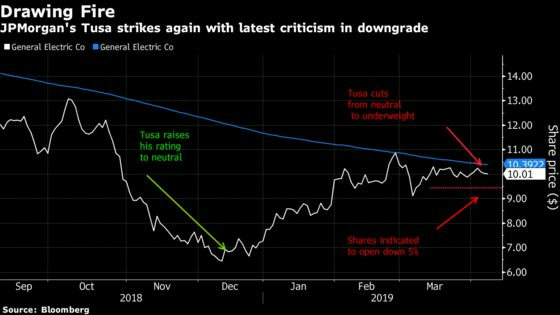 GE is already down more than 6 percent as JPMorgan’s prescient bear Stephen Tusa (who briefly changed his rating to neutral on the industrial conglomerate in December) has renewed his deep skepticism of the company, and has brought back his downgrade to underweight. Interestingly, he had been neutral for the entire first quarter with a price target that was 40% below where the stock had been trading for much of those three months, but with his latest target cut (now at $5 from $6 prior), he assumes 50% downside from the Friday close, noting investors are “underestimating the severity of the challenges.” He writes that free cash flow is being overestimated by the Street. Boeing is also drawing renewed criticism, with a downgrade by BofAML analysts and critical commentary at KeyBanc following their decision to cut 737 Max production in light of the Ethiopia crash. KeyBanc identifies ATI, ARNC, KALU, CRS, HAYN as among the most exposed specialty metals firms to the aerospace supply chain, while LXFR and MTRN’s exposure is "much more manageable." BofAML writes that Boeing’s issues are “not just a simple software fix” and now put the timeline of disruption for the plane manufacturing giant at 6-9 months (up from their prior view of 3-6 months). Boeing is down more than 4 percent in pre-market trade. And in more knock-on effects, Spirit AeroSystems drew a cut from Canaccord due to the actions mentioned at Boeing above, citing the prospects for incremental costs and the loss of volume. Southwest Airlines too received a downgrade, this time from Raymond James. Southwest, as of the time of the Ethiopia crash, had the greatest U.S. exposure to the grounding of the aircraft due to the number of Max aircraft it operated. See a more complete breakdown as of March here. 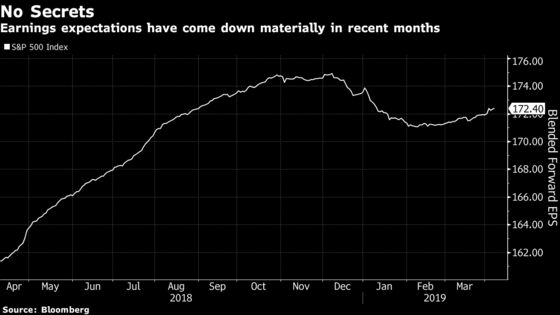 Another key ax came down on an industrial name, with Morgan Stanley’s Adam Jonas cutting the price target on Tesla Inc., who raised the question about whether market sentiment on the shares of the electric vehicle maker could actually feed through to the real business. His price target dropped to $240 (down from $260), his lowest price target on the name since his $153 price target more than five years ago. He also cites investor concerns about financial strength and liquidity, which could pass through to employees and customer perceptions of the brand as a possible risk for the company, as market sentiment evolves. Shares, however, are up in the pre-market, likely as the board’s review of allegations Musk had a physical altercation with an employee found no such circumstance, and a new relationship with Fiat Chrysler that may help the Italian car-maker comply with European Union emission rules. For those tiring of politics dominating the landscape of late, earnings season can’t come soon enough. Its not news that EPS expectations have come down since last quarter, but some are asking if that’s the bottom. Deutsche Bank strategists for one expect flat earnings and "in-line beats" for 1Q after consensus was cut by the most in 3 years in the last reporting period. But that begs the question on how stocks can perform should this unfold. As we sit near all-time highs, will inline cut it given expectations have already come in? Barclays analysts expect 1Q results to be "smaller" catalysts for stocks this time around with the average implied share price move around earnings approaching 3.6%. This, especially after the prior quarter’s season which the analysts deemed "volatile." Citi analysts for their part, in a note clients, wrote "get ready for tough compares" in the small-mid cap space. This surprisingly may apply to Bed Bath and Beyond, though not technically the beginning of earnings season (that comes with banks later this week), it is a relatively small name, despite its ubiquity in retail locations across the United States. It does have its finger on the pulse of the consumer (even though their market value has shrunk 13 percent over the past year, which INCLUDES its 62 percent gain YTD), and options there are implying a much LARGER move than normal. U.S. Homeland Security Secretary Kirstjen Nielsen has resigned from the Trump administration, an action that CNN reported was not done willingly; Boeing cut production of its troubled 737 max jet; Starboard withdrew its proxy fight at Dollar Tree; Barron’s was out cautious on hemp stocks as the CBD craze builds, and was positive on Foot Locker citing its sales and earnings momentum, and positive on Microsoft’s ability to compete with Salesforce.com; Fred’s hired an adviser to pursue attempts to downsize, the WSJ reported; Wells Fargo’s largest shareholder, Warren Buffett, called on the bank to hire a new CEO from outside the bank and Wall Street, according to an interview in the FT; Auburn and Michigan State each lost bids to make it to the men’s NCAA basketball championship in the last seconds of their respective matches. UVA will take on take on Texas Tech with the former a 1.5 favorite with a total opening of 117 points, according to Oddsshark.com. Semiconductor stocks have been among the strongest gainers in 2019, with the sector recently hitting record levels, but the surge is causing a number of analysts to second guess the advance. Just days after Morgan Stanley lowered its view on Micron Technology, Cowen cut its own view to market perform, citing the "confluence of a sea change in the competitive environment," along with fundamentals for DRAM memory chips, which it sees "remaining weaker and longer in duration than what is contemplated by investor expectations.” While some analysts and companies have been pointing to a rebound in the second half of the year, Cowen wrote that average selling prices for either DRAM or NAND memory chips may not see “derivative improvements” until the first quarter of 2020.